Up to the minute weather reports and current forecasts for Boulder Creek and the Santa Cruz Mountains. If you know of a weather station located in the San Lorenzo Valley and it's not listed here. Please send an email to the webmaster. This weather station is located at 13057 Highway 9 in in central downtown Boulder Creek. This personal weather station is located near Redwood School, just north of Boulder Creek. Just west of downtown Boulder Creek at approximately 795 feet. South of Boulder Creek in Ben Lomond. South and east of Boulder Creek, on Ben Lomond Mountain. This recently added personal weather station is located in Lompico. This station is located at the Felton Fire Station. 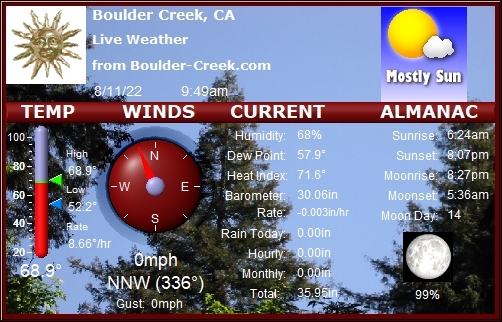 This weather station is located roughly west of Boulder Creek in the small mountain-top village of Bonny Doon. GIS Mapping Portal to Real-Time Environmental Observations and NOAA Forecasts. Allows one to get current weather conditions across the US. Operating and maintained by HiWay9 and San Lorenzo Water District. Warning: Be sure to check date and time of weather update since it appears that its not frequent on the HiWay9 server compared with the Boulder Creek report from the beginning of this page. Santa Cruz Weather Report - this one appears to be the most up-to-the-minute weather forecast report. Weather Underground - Santa Cruz - another source for weather information. Revised: 28 Mar 2008 20:42:49 -0800.